Protéus S.A. (PROTEUS) is a worldwide recognised biotechnology company which focuses on the discovery, engineering and manufacturing of proteins of industrial interest, and on the development of innovative protein-based bioprocesses. The efficiency of PROTEUS' technology platform has been demonstrated by the successful track record of the company in the life science industry, including healthcare, fine and specialty chemicals, environment and bioenergy. PROTEUS reinforces the competitive edge of its clients by providing them new industrial solutions and new industrial property rights. The comprehensive offering of PROTEUS includes industrial manufacturing capabilities to accelerate the development, the industrialisation and the time-to-market of its clients' new products. PROTEUS will be implied in WP2 in the identification and optimisation of PU degrading enzymes and in WP7 in the fusion of a substrate binding domain to promising PUases. As one of our industrial partners, they will also take over an active role in WP8 (Dissemination and exploitation). 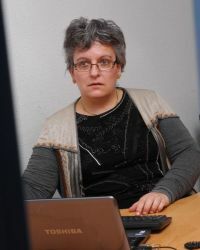 Dr. Cécile Persillon graduated in Industrial Biochemistry from the INSA (Institut National des Sciences Appliquées) of Toulouse, France and received a PhD in 1993 from INSA in Toulouse. In 1995, she joined the biotech company Appligene, Illkirch (France) as research scientist. She established and developed recombinant expression of enzymes and nucleic acid extraction kits. Cécile was one of the first scientists to join PROTEUS as research scientist. PROTEUS is a biotechnology company dedicated to the discovery and design of novel enzymes and bioprocesses for industrial and environmental application. She rapidly became project manager. Cécile successfully managed several challenging R&D programs including biodefense and environmental projects. She acquired a strong experience in the management of multidisciplinary project teams. In 2010, after completion of the acquisition of PROTEUS by the PCAS Group, Cécile Persillon was appointed scientific manager. Her duties now include the design of scientific strategies that meet the expectations of the company and its clients.